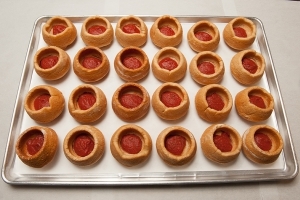 Shred pepperoni using a food processor or meat chopper. Mix with diced turkey ham in a large container or bowl. Weigh 1 ounce of mozzarella cheese to determine portion size. 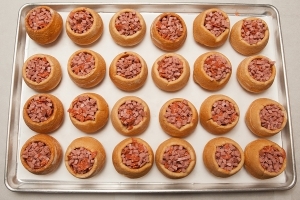 Spray sheet pans with pan release spray and place bread bowls on sheet pan. 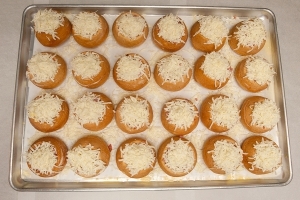 Spread 1 tablespoon of spaghetti sauce inside each bread bowl. 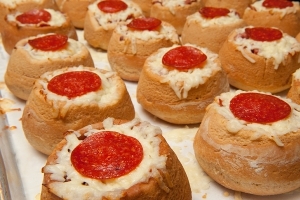 Scoop mixed pepperoni and turkey ham with a #16 scoop and place in bread bowl. Top with 1 ounce of mozzarella cheese. CCP: Heat to 135 degrees F or higher for at least 15 seconds at the completion of cooking process. Cover and place in warmer until ready for service. 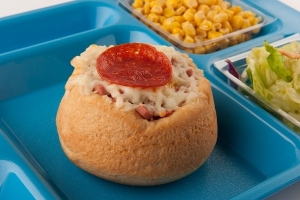 Portion 1 bread bowl per serving. Each portion provides 2¼ oz. eq. meat/meat alternate and 2 oz. eq. of whole grains. If changes are made in ingredients, check crediting information and re-calculate the nutrition analysis. "Culinary Techniques for Healthy School Meals" provides seasoning and serving ideas for sandwiches. 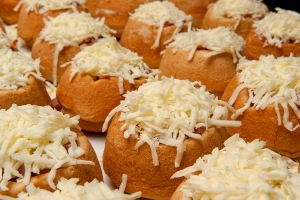 Do not overcook as bread bowls will become hard. Pizza sauce can replace spaghetti sauce, but the nutrient analysis must be recalculated.